This was not an interim Budget. 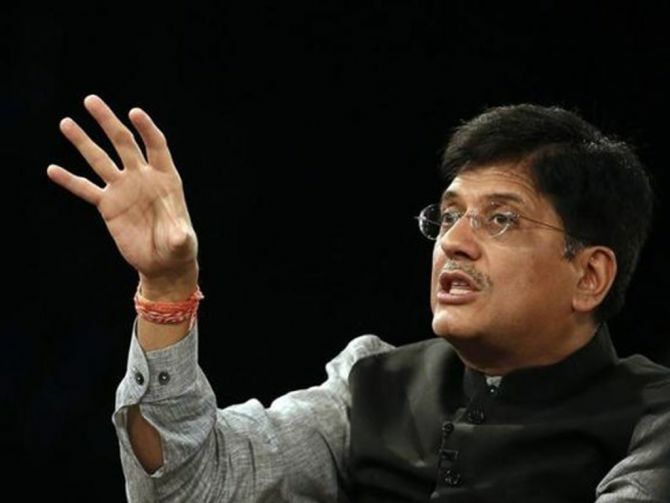 What Finance Minister Piyush Goyal presented on February 1 has no resemblance with any of the previous three interim Budgets presented by his predecessors -- Jaswant Singh in 2004, Pranab Mukherjee in 2009 and Palaniappan Chidambaram in 2014. No interim Budget in the past announced a new programme with as huge an annual expenditure outlay of Rs 75,000 crore as Mr Goyal's scheme, Pradhan Mantri Kisan Samman Nidhi (PM-KISAN), which will offer an annual income support of Rs 6,000 per year to all farmer families that have cultivable land up to 2 hectares. Of the 146 million operational land holdings in the country, according to the Agriculture Census of 2015-16, almost 86 per cent have an area below two hectares. This gives a figure of around 125 million operational land holdings of below 2 hectares. The Budget numbers are not far off the mark. The scheme, according to Mr Goyal, will benefit over 120 million farmer families. Remember that almost a third of these families live and cultivate land in Uttar Pradesh and Bihar. The electoral benefit of such a scheme, therefore, should not be underestimated. No interim Budget in the past announced a pension scheme and also provided a token expenditure allocation of Rs 500 crore for rolling out such a programme for an estimated 100 million workers in the unorganised sector. The scheme will cover only those workers, who get monthly wages of less than Rs 15,000 and would thus cover about a fourth of the total workers in the unorganised sector. No interim Budget in the past also announced as big an income-tax concession as Mr Goyal did by providing full tax rebate to those who have a total taxable income of Rs 5 lakh and below. His estimate is that it would cover even those whose gross annual income is up to Rs 6.5 lakh and the total number of beneficiaries next year could be as high as 30 million small taxpayers. In addition, there are other benefits such as increasing the standard deduction limit for all salaried persons to Rs 50,000 and raising the limit for deducting tax at source for bank interest earnings from Rs 10,000 a year to Rs 40,000. In other words, the interim Budget for 2019-20 has offered financial relief to at least about 130 million individuals and another 120 million farmer families. The monthly amount of income support could be small at Rs 500 per month, but since the beneficiaries would be largely in Uttar Pradesh, Bihar, Madhya Pradesh and Maharashtra, the scheme would provide an effective political answer to a similar cash transfer scheme rolled out in Telangana and Odisha, though using different yardsticks. If the schemes are efficiently rolled out, this is a huge number of beneficiaries in the country across states and across sections of society. The total financial burden for all these schemes would not be less than Rs 99,000 crore in a year. Since these are not one-off benefits, these will constitute a financial burden for the coming years as well. This is almost close to half a per cent of the gross domestic product (GDP) India is estimated to have next year. Forget about interim Budgets, one cannot easily recall even a full Budget of any government in recent times having rolled out benefits of this order to such a large number of people. If these moves do not fetch Mr Modi the required number of votes to retain power in New Delhi, the disenchantment with the Modi government must also be huge and widespread. Yet, the surprise is that the fiscal slippage that has been shown in spite of bearing the burden of these schemes is almost negligible. In 2018-19, the fiscal deficit has been revised at 3.4 per cent, compared to the Budget estimate of 3.3 per cent of GDP. Similarly, for 2019-20, a fiscal deficit of 3.4 per cent of GDP represents only a minor slippage from the 3.1 per cent figure promised last year. And given the government's recent record having revised its GDP estimates upwards for the last few years, the final numbers may actually not deviate from even the targets. But a few questions on the interim Budget's revenue assumptions still need to be asked. The GST revenue shortfall of Rs 1 trillion in the revised numbers for 2018-19, when compared with Budget estimates for the same year, has been largely made good by a sharp rise in corporation tax revenues by about Rs 50,000 crore over and above the Budget estimates, a Rs 17,500-crore increase in customs duty collections, thanks to the decision to raise customs duty on a variety of goods during the year, and a Rs 29,000-crore decline in expenditure under its grants and loans to states, due to lower requirements under compensation to the states for revenue losses on rolling out the GST. Receipts from disinvestment, which so far have been estimated at only Rs 35,500 crore, are expected to reach the target of Rs 80,000 crore, according to the interim Budget, which appears to be an ambitious task. If any of these revenue estimates are not met by the end of March 2019, the final fiscal deficit number for the current year could be a cause for concern. For 2019-20, the Budget numbers show an attempt at reining in expenditure under various heads. The government's capital expenditure, after going up by 20 per cent this year, is slated to grow by only 6 per cent next year. The outlay for the national rural employment guarantee programme and the National Highway Authority of India will see a marginal decline, though defence outlay is seeing a 7 per cent increase in 2019-20 after witnessing a small rise of 3 per cent this year. On the whole, Mr Goyal's first Budget for the Modi government seems to be an elaborate exercise that resembles all the features of a full Budget. The similarities include even the assumptions on revenue growth and expenditure compression that a full Budget makes in the belief that the same government would come back next year to present the revised numbers if they go astray. Has Modi Sarkar delivered on Budget 2014?